For cement makers battling cost pressures, the fall in diesel prices provides some respite. Retail diesel prices were cut by 10-15 paise in key cities on Tuesday, courtesy softening global oil prices. Diesel price in Delhi is currently at ₹ 64.66 per litre. In the last one month, retail diesel prices fell by 10%. Many cement makers make higher use of roadways than railways to transport cement. So declining fuel cost will boost freight savings. Freight cost is estimated to contribute around 25% to the industry’s overall cost. Secondly, the sector would benefit from the revised axle load norms for trucks in quarters ahead. Announced in July this year these rules led to an increase in rated load capacity of trucks. Thus, this allowed transporters to carry additional weight. 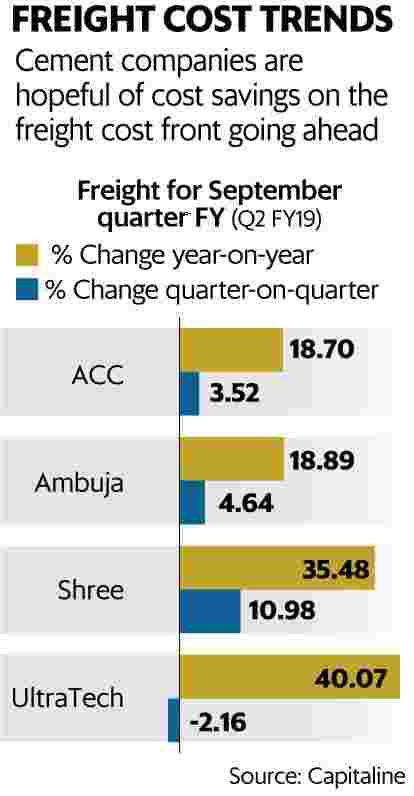 Freight cost of key cement manufacturers remained elevated in the September quarter compared to the year ago period. (See Chart). Shree Cements Ltd saw some benefit from these norms in the September quarter, it said in a post earnings conference call. But given the higher reliance on roadways its freight cost spiked more than peers, sequentially. Its freight mix stands at 6% railways and 94% roadways. Similarly, Ultratech Cement Ltd also saw some gains in logistics cost. Among large companies, it was the only one to see a decline in freight cost sequentially. Road transportation makes up 75% of Ultratech’s total freight cost. While it foresees road freight costs reducing by 7–7.5% full benefits of these norms will be seen in the March quarter of this fiscal year. Meanwhile, price of key input material petroleum coke (petcoke)—a crude derivative has also declined. “Current global petcoke prices are 23% lower versus the average for the QE September 2018 average, and we estimate QE Dec-18 petcoke cost to be down ~10% on a sequential basis (adjusted for lagged impact). The industry also expects 6-8% savings in per-ton freight cost owing to change in axle load norms in F2H19. In addition, recent decline in diesel prices will also lead to easing in freight cost," Morgan Stanley said in a report dated 7 December. “This will be partly offset by higher railway freight (peak season surcharge), the overall cost per ton will decline in the second half of the fiscal year, supporting margins," it added. According to JM Financial Institutional Securities, on a per tonne basis, cement companies would see cost savings of Rs120-150 from March quarter of financial year 2019. Although input costs inflation is slowly easing, cement prices are still subdued. And for earnings to improve, revival in prices is crucial.